Who knows about the differences between #2 heating fuel and on road or off road diesel? As I understand it, on road diesel has lubricants, anti-gel additives and road based taxes in it. Off road generally has the lubricants but not the anti gel additives. #2 has non of the additives. Is it reasonable to buy the additives and add them to #2 heating fuel. Are the additives available to make #2 ready for my engine? The reason I ask is I have more than a 1000 gallons of storage for heating fuel in the basement. I don't have anything setup for storage of diesel fuel and I have to go a ways for onroad or off road diesel. It would be a lot easier if I could make what I have in the basement usuable. But convience isn't worth sacrificing the longevity of my equipment. Sam there are pages and pages in the archives on the topic. On road is a low sulfur product now and many places have moved to the ultra low sulfur. IN OUR AREA off road and heating are the same. We do have to treat for gelling. We cut using 30-40 % kero at work. I use straight heating oil at home. I (if I remember) do dump in some power service now and then. But my tractor is parked in the house by wood stove during winter. Return fuel keeps fuel warm when outside working. Here is one of the threads on using Home Heating Oil in a tractor. You can scan this forum as well on Diesel Fuel and Maintenance. I had read the thread about cetane, but that seemed to talk about whether premium diesel with a 50 cetane was needed or not. I am more interested in understanding the need for lubrication. When I searched the archives, I ddn't find anything illuminating, but maybe I wasn't form the question well. I found this on the net. Interesting. See the link below, from Hess Corp.
My wife once worked for an oil and fuel distributor. I asked her if #2 Fuel Oil (Home Heating Oil) was the same as Off-Road Diesel Fuel. Yep. Same thing. Comes out of the same tank, and can be used for either purpose. The same delivery truck can either fill your home heating tank, or your outdoor fuel storage tank for the farm machinery. Your home heating oil should be dyed red, indicating that it is NOT for highway use.....since there are no road taxes applied to it. Don't get caught using it in your pickup, semi-tractor, or any other highway vehicle........but burn all you want in your tractor. #2 fuel oil is a bit too thick for use in cold weather. It will gel up at temperatures around 0 degrees F. If the weather is cold there, you should mix it 50/50 with an equal amount of kerosene. Other than that, you don't have to worry about a thing. Use all you want. I had a fuel truck driver tell me the same thing, when he picked up a load of #2 heating fuel, the only diffeence from off road was the dye. But a diesel operator I know said that used to be true, but it isn't anymore, that the "new" engines need the lubricants put in off road and highway diesel. I don't really want to use my tractor to do a study, though. It would be a heck of a lot easier for me to use the heating fuel from my 1000 gallons in storage rather than drive over to get it from someone's pump in a gerry can. But if I have any question, I am going to er on the side of caution. It would seem the best way for you to be 100% safe is to ask who you buy your oil from. As always, there are a few exceptions to the rule. In some locations, it may be against the law to store home heating fuel inside any living quarters. In such places, the home heat fuel tank must be located outdoors. If the home heating oil storage tank is located outdoors, the possibility of the fuel gelling up is quite high, so the local fuel dealer may be supplying a 50/50 mixture of #2 fuel oil and kerosene. (#1 Diesel Fuel). For those of you who have your home heating oil stored outdoors, it's highly important that you do no further dilution with kerosene. There are lubricants in diesel fuel that are designed to protect and lubricate the injection pump. 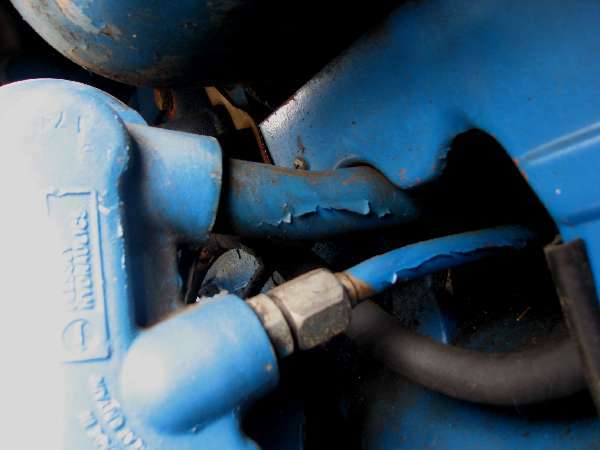 Any further dilution can cause severe wear and tear on a diesel engine's injection pump. #1 diesel may have additional lubricants added to it, by the fuel supplier, to help make up the difference.......but #1 home heating oil (stored outdoors) probably doesn't contain these extra doses of lubricant, since it's not intended for use in diesel engines.